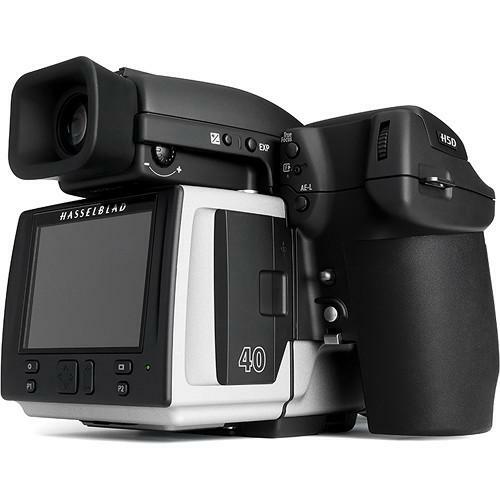 We recommend checking out our discussion threads on the Hasselblad H5D-40 Medium Format DSLR Camera 3013658, which address similar problems with connecting and setting up Medium Format Cameras Hasselblad. The user manual for the Hasselblad H5D-40 Medium Format DSLR Camera 3013658 provides necessary instructions for the proper use of the product Photography - Digital Cameras - Medium Format Cameras. The H5D-40 Medium Format DSLR Camera from Hasselblad is the 40MP model of the new Hasselblad H system of medium format DSLR cameras. The H5D-40 model contains a 32.9 x 43.8 mm 40MP (7304 x 5478) CCD sensor. With its large light path, it creates high resolution images with great clarity and color rendering without gradation breaks. Hasselblad's Natural Color Solution (HNCS) creates accurate colors, with natural skin tones and an ability to capture specific product colors and tones that are difficult to reproduce. The improved Hasselblad Image Processing Architecture ensures fast performance and transfer speed. If you own a Hasselblad medium format cameras and have a user manual in electronic form, you can upload it to this website using the link on the right side of the screen. Max Sync Speed Flash can be used at all shutter speeds. Windows: XP (32 and 64 bit), Vista (32 and 64 bit), Windows 7 (32 and 64 bit). Battery Type Rechargeable Li-ion battery (7.2VDC, 2900mAh). Box Dimensions (LxWxH) 11.1 x 11.0 x 7.0"
The user manual for the Hasselblad H5D-40 Medium Format DSLR Camera 3013658 can be downloaded in .pdf format if it did not come with your new medium format cameras, although the seller is required to supply one. It is also quite common that customers throw out the user manual with the box, or put the CD away somewhere and then can’t find it. That’s why we and other Hasselblad users keep a unique electronic library for Hasselblad medium format camerass, where you can use our link to download the user manual for the Hasselblad H5D-40 Medium Format DSLR Camera 3013658. The user manual lists all of the functions of the Hasselblad H5D-40 Medium Format DSLR Camera 3013658, all the basic and advanced features and tells you how to use the medium format cameras. The manual also provides troubleshooting for common problems. Even greater detail is provided by the service manual, which is not typically shipped with the product, but which can often be downloaded from Hasselblad service. If you want to help expand our database, you can upload a link to this website to download a user manual or service manual, ideally in .pdf format. These pages are created by you – users of the Hasselblad H5D-40 Medium Format DSLR Camera 3013658. User manuals are also available on the Hasselblad website under Photography - Digital Cameras - Medium Format Cameras.